MTA is the official television network of the Ahmadiyya Muslim Community. It was established in 1994 by the Fourth Supreme head of the Ahmadiyya Community. Given extremely limited financial, technical and human resources, MTA International made its humble beginnings on 1 January 1994. Initially launched to broadcast the Friday Sermons, programmes were introduced to cover a schedule which quickly expanded from 4 hours, to 12 hours and finally a full 24 hour broadcast. His Holiness would personally participate in these programmes, allowing the millions of Ahmadi Muslims to feel as though they were in his presence despite huge geographical distances. Since its inception in 1994, MTA has been running under the direct supervision of the Head of the Ahmadiyya Community, the Khalifatul-Masih. This guidance has proven to be a galvanising factor, propelling the channel to new heights. Because of direct guidance, within 20 years, MTA has setup 3 channels, 15 International production teams that produce content in over 12 languages, which are broadcasted from over 10 satellites globally. One of the fundamental roles of MTA is to provide a platform for the Khalifa to address his community members around the world and also the wider global audience. From the LIVE Friday Sermon broadcast every week, to coverage of international visits and special receptions, these broadcasts not only help to enhance the spirituality of viewers around the world, they also help to build a bond between Ahmadi Muslims and their beloved Khalifa. His Holiness also presides over regular studio based classes for youth of the community, where religious, social and academic topics are discussed. MTA has a global audience and MTA’s vast array of programmes ranging from programmes relating to issues youth face, interactive programmes where viewers can ask questions about Islam and religion, travel, cooking and technology are regularly broadcast to cater for different tastes and interests. LIVE and interactive call-in shows connect MTA’s viewers to the content, creating a forum to discuss the most important religious and social issues that affect the world today. No matter the age, dialect or cultural background, MTA International creates programming to suit all. Documentaries, language classes and science shows promote the acquisition of knowledge as MTA considers education to be the right of all and not just for the privileged few. This principle is even more important when considering that a large percentage of MTA’s viewers are in Third- World countries, many without access to schools. MTA’s central production headquarters are based in South West London comprising of multiple studios that cater for up to 12 different programmes a week, both live and recorded. Alongside these purpose-built studios, a number of MTA’s programmes are filmed on location for which we have dedicated outside broadcast facilities. Post-production is carried out in-house in MTA’s editing and graphics suites using a fully tapeless workflow which has vastly cut down turnaround times. The message of Islam Ahmadiyya cannot be confined to just one country or culture. It is transcending geographical boundaries and resonating amongst all of humanity. Over the last 20 years, MTA Studios have been established in many countries. These studios contribute to the scheduled broadcast by creating programming tailored to country’s language and culture. MTA has a dedicated department to provide translation of the speeches and addresses of the Head of the Worldwide Ahmadiyya Community. For live broadcasts of these events and a selection of other programmes, simultaneous translations are available for MTA’s viewers. From its inception in 1994, MTA International has had one core objective, to spread the true teachings of Islam to the corners of the Earth. Currently there are three free-to-air subscription free Channels as part of the MTA network. MTA1 broadcasts in America, Asia and Africa. In 2004 MTA 2 was launched to specialise in European languages and so is solely broadcast across Europe. MTA3 was launched in 2007 as a purely Arabic language channel which broadcasts across the Middle East, North Africa and North America. 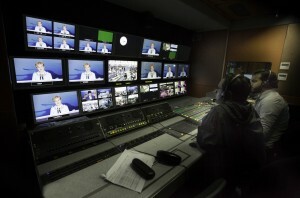 The transmission MCR in South West London handles the play-outs of recorded programmes and also facilitates LIVE broadcasts from around the world. A Teleport system is also functioning in the USA to transmit MTA1+3 and MTA Infocast for the benefit of MTA’s viewers in North America. As a pioneer in the world of Islamic broadcasting, MTA has continued to be at the forefront of technological advances, utilising all potential avenues to reach as wide an audience as possible. MTA can be streamed to desktop computers, laptops and tablets through MTA’s online streams which are managed in- house. 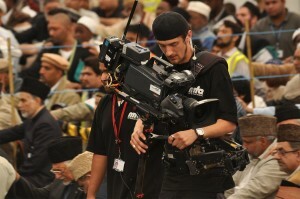 For live coverage of MTA’s biggest events we have tens of thousands of viewers worldwide benefiting from this service. Mobile applications for iPhone and Android devices have taken MTA’s streaming services one step further by allowing viewers to browse MTA’s schedules and watch MTA while on the move. In 2013 MTA On Demand was launched to provide viewers with an online platform to watch MTA’s programmes wherever and whenever they want. MTA prides itself on being a unique broadcaster both in MTA’s content and workforce. Out of the 300 staff members that work in MTA’s London offices, 90% are volunteers who happily dedicate their time to assist in the running of the network. Doctors, accountants, students and those from all fields and backgrounds regularly work in MTA’s different departments, providing production, technical and administration support. As a community channel, members of the Ahmadiyya community have always seen it as their duty to serve the community in whatever capacity they can.